I love it when I receive requests from you, super amazing readers and friends, about what you want to see over here–especially when whatever is on your mind is on mine as well. 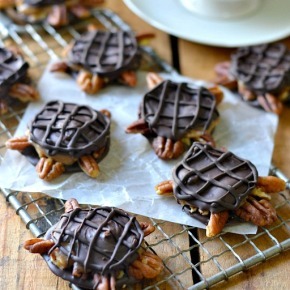 And I have been thinking a lot about Chocolate Turtles lately for some reason. It must have been because of all the chocolates I have been making. Oh, who knows why I think about half of things that I do. I swear the majority of my brain space is dominated by donuts (and that the honest-to-God truth!) With a close tie with potato chips, of course. I will have you know that I haven’t had a chip in a while though. I know. It’s a miracle. I chose to go with a raw caramel sauce because well, honestly I’m waiting for a plumber to come fix my kitchen sink and I needed something quick to make with an easy clean up. My sink isn’t wanting to do its proper job and actually drain water that comes from the tap. That causes a big problem with doing dishes. Grrrrr. That is why real caramel sauce was out of the question however if you would like to use a heated sauce, either follow this recipe or melt store-bought vegan caramels like Cocomels. They are super good with the raw caramel sauce however–if you have never made it before let this be your excuse to get to it! Please see this post on tips for melting chocolate and all things chocolate-making if you run into any troubles. In a high-speed blender, whip up all the ingredients for the raw caramel sauce until completely smooth. Allow to chill in the refrigerator to cool down. Line a baking sheet with a piece of parchment paper. Melt 1/2 c. of the non-dairy chocolate chips. Place in a Ziploc bag with a slit cut out of the corner and drip 1 tsp. of chocolate onto the parchment paper, making circles (see picture above). You may want to use the back of a spoon to flatten down a little bit. For each chocolate circle, place 6 pecan slices on top of the chocolate in the position for the head, legs, and tail (see picture above). Fill in the remainder of the chocolate with smaller pecan pieces (as seen above). Place the baking sheet in the freezer for 5-10 minutes. Remove the sheet and pour the raw caramel sauce into a Ziploc baggie to pipe on top, about 1 tsp. worth. Freeze again while you melt the remainder 1/2 c. of chocolate. Pipe the remaining chocolate on top of the caramel. Smooth out with the back of a spoon to ensure it is evenly spread. PLEASE READ: Do this one at a time because the warm chocolate hitting the items that have been in the freezer will cause the chocolate to quickly harden. If you wait too long, your chocolate will be unworkable. Allow the turtles to fully set (either back in the freezer or if you keep them on the counter, they will harden as well). This is the cutest dessert, ever. LOVE! Thanks for such an awesome recipe! These tasted out of this world. I’m making another batch now. Do you know why these cute little treats have cholesterol in them? I am confused, as anything vegan automatically means cholesterol free. There’s no exceptions to that. I can’t wait to make these! But did I miss how to make the swirl on top? Is it just extra of the same melted chips? Ok, so i tried to make the caramel sauce and it was a complete flop. I tried to mix it up in a vitamix but i ended up having turn it off because the motor was getting to hot. Didn’t even spin the stuff around. Any suggestions? My kids would LOVE these! These look amazing and I am so eager to make them! Could you recommend a particular kind of vegan chocolate chip? I feel like all the ones I look at say they “may contain milk.” Thanks so much! I am totally going to try to make Easter bunnies with vegan white chocolate and cashews, in addition to chocolate bunnies with pecans! Thanks sooooo much for this post! Okay for reals though, that is THE cutest idea! Will you send me a picture of it when you do??? Thank you for share.It very nice.I like to eat chocolate. Yummmmmmmmm these look awesome! I’ve never thought to make a caramel sauce out of soaked dates. Love it! can you substitute the carmel for organic peanut butter?? My family aren’t really a huge carmel fans but i was worried if the peanut butter would ruin the taste? This looks amazing nonetheless, great work!!! These look ridiculous!!! I bet they’d be a hit at any party. This recipe is so cute. Could you substitute California pitted dates for Medjool dates? I have 3 Medjool dates and a whole package for California pitted. I am really wanting to make these for my daughter’s valentine party. She loves the Ninja Turtles right now. There is no place locally to purchase Medjool dates. Oh these are adorable! I’m blown away by all of your recipes – awesome, I think they’ll be infesting my kitchen soon! I want these! They are super cute. How long did it take you to get them all so freakin perfect? I love me some date caramel. It’s so lovely and practically guilt-free. So cute! I’ve seen “turtles” before but never actual turtle turtles!! They sound might tasty too. These are so darn cute!!! Happy Valentines Day (Early) Love! These are so adorable! Nice job! I love how with the raw caramel sauce these are actually pretty healthy, and not really a guilty treat at all! So yummy! I am currently trying to figure out how to make a raw healthy “cream cheese frosting” right now. It’s so awesome when you can indulge without the guilt! Looking forward to trying these soon. OMG! You made them into actual turtles. I’M DYING! This recipe combines my two favorite ingredients– pecans and chocolate. And the turtle-shape? So cute! Thanks for sharing– I can’t wait to try this! These are so stinkin’ cute, I absolutely adore them!! Thank you for fulfilling my request, Cara! 🙂 Can’t wait to make these! The layering technique photos are fun and SUPER helpful! I’m excited about the raw caramel too, as I happen to have all the ingredients and this seems much easier than attempting regular caramel! 😉 Win win! I’m so glad you approve! And you are so welcome–such my pleasure, Kat. These look awesome!! I can’t wait to try them out 🙂 there is nothing cooler than a homemade box of chocolates for Valentines Day, food allergies or not! Thanks for sharing! !